Top seed, China’s Fan Zhendong made the best possible start on Friday 6th April in his quest to win the Men’s Singles title at the Lion 31st ITTF-ATTU Asian Cup Yokohama 2018, impressively he beat Chinese Taipei’s Chuang Chih-Yuan in three straight games (11-4, 11-4, 11-6). However, in his immediately ensuing contest, in his quest to secure a title he has never won, he was beaten by Tomokazu Harimoto; the Japanese teenager, only 14 years old, emerging successful in four games (11-8, 8-11, 11-9, 11-8). The result means that Tomokazu Harimoto has now beaten the players who are the most recent to be listed at the top of the Men’s World Rankings. 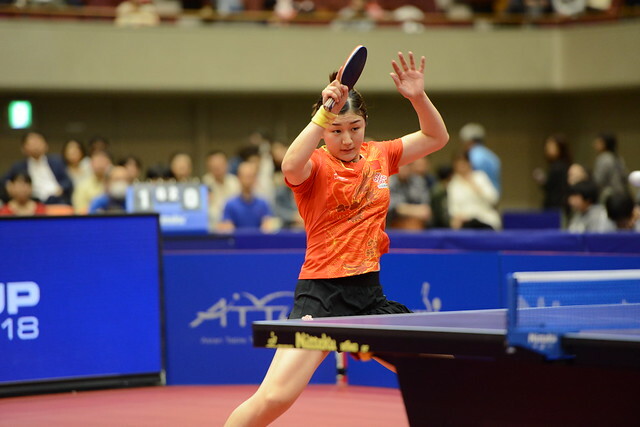 Fan Zhendong is the current owner of the position, last month the position belonged to Germany’s Timo Boll, last year Tomokazu Harimoto beat Germany’s Timo Boll in the final of the Seamaster 2017 ITTF World Tour Czech Open in Olomouc. Once again the result not only underlines the technical talent which Tomokazu Harimoto possesses, it also endorses his mental capabilities; he has no fear, every player is a player and the bigger they are, the harder they fall! Furthermore, what better place to achieve the remarkable feat than on home soil in Japan! Earlier in the day in his opening contest, he had overcome Kazakhstan’s Kirill Gerassimenko (11-9, 8-11, 11-8, 11-9). Tomokazu Harimoto now meets Chuang Chih-Yuan in the concluding group stage contest, Fan Zhendong opposes Kirill Gerassimenko. Players finishing in first and second places advance directly to the quarter-finals; third place and a play-off match for last eight spot beckons.